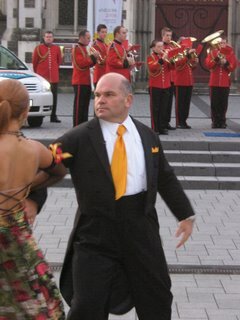 I braved the cold at 8am today to watch Rodney and Krystal dance a tango in Cathedral Square, Christchurch. Hosted by a local radio station and backed by the NZ Army Band, the two stars drew a crowd of about 100, many of whom also joined in the dancing. It was a great atmosphere and Rodney was the star. He circulated, danced with several partners, told jokes and solicited votes-bigtime. Afterwards, the radio crew and Rodney's small entourage drove 20Ks out Rodney's (and mine) old school-Rangiora High. The reception was bloody great. The Assembly Hall was packed with at least 500 kids and staff. They gave Rodney and Krystal a huge cheer as they entered the hall and didn't let up throughout. Rodney and Krystal tangoed and the crowd went wild. It was like it was Posh and Becs or Brad and Ange. Rodney kept them entertained with imitations of Brendan Cole, praising his old school, praising the Crusaders, shameless vote grubbing, joking and a bit of sound work hard/study hard/be proud advice. Rangiora High then put on its own five girl dance troupe, which was the rockingest thing I've ever seen in that hall. Rodney couldn't get away as he was mobbed by teachers and a big group of mainly female pupils. Everybody was buzzing. It was a great reception and I'm sure it was good for heaps of votes. If ever I had any small doubts about the positive impact "Dancing With the Stars" has had on Rodney's image (and waistline), they were well and truly dispelled today. I was proud of my old school and our old school was certainly proud of "I'll always be a Rangiora High boy" Rodney Hide. Wish I could have skipped Uni and come along. Did you follow the entourage to Crusaders training?? No unfortunately. I was scared they'd try and recruit me again. I just haven't got the tiiime! Thanks for the photos. How'd the presentation go? If ever I had any small doubts about the positive impact "Dancing With the Stars" has had on Rodney's image.. I am proud of Rodney, and of all of us too for sticking along him from day one. This sounds like another productive day. Out of interest who is minding the store while Rodders dances the night away? Rangiora High is my school too.